Whether you prefer a slow, gentle stroll along the seaside or a more strenuous trail running experience, the Rantaraitti (seaside promenade or the waterfront walkway) in Espoo, Finland’s second biggest city is the thing to do. It literally has it all: possibilities for berry and mushroom picking, cycling, running and walking, the sea and forests, gentle paved and accessible paths as well as demanding trails in the adjoining forests, fishing and bird watching opportunities, benches for a quick break but also cafés for longer pauses. In the winter when the sea is frozen, you can even walk over the ice onto nearby islands or join ice-fishers on the ice. 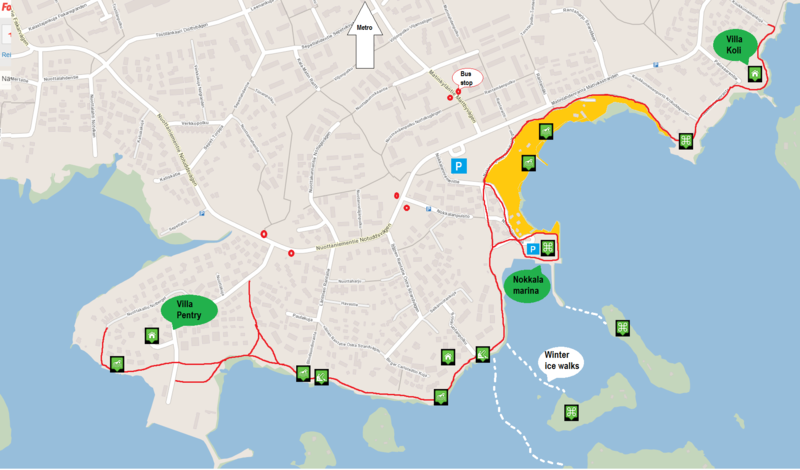 The Rantaraitti streches 40km (25mi) along the shores of Espoo but you can enjoy any part of it, short or long, and arrive by car, public transport, bike, and even by boat! 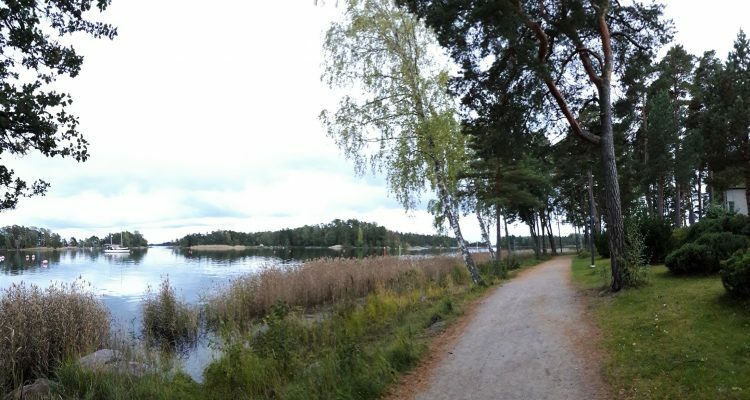 The Rantaraitti runs past hundreds of interesting places scattered along the coastline of Espoo, the capital area, and Southern Finland in general. It is very accessible and well-marked with signs, estimates of distances, and helpful hints for casual visitors (like information on the animals in the area, signs for bus stops, etc.). Because the Rantaraitti is such a long stretch of road, the easiest thing is to get to know it in sections. I have gathered some sections which are easiest to visit and offer the most wonderful memories for visitors. 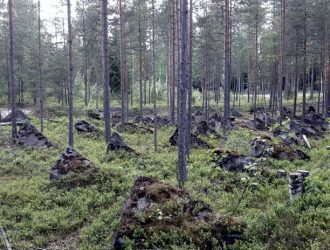 The Rantaraitti in Matinkylä offers sandy beaches, forests fit for berry picking, and plenty of beautiful sights to see. 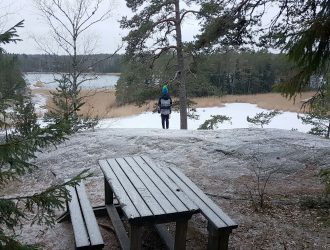 A great way to enjoy the Matinkylä bit of Rantaraitti is to start it at Nuottaniemi or at the other end, at Koukkuniemi. The entire route marked on the map is 3km (1,9mi), and there are plenty of things to see along the route such as beautiful villas, views to the islands, old stone piers you can use for fishing, as well as sandy beaches perfect for relaxing and swimming. You can also access nearby islands easily from Matinkylä: you can take a waterbus during summertime or just enjoy a lovely ride around the archipelago and return to the same harbour. You can check for schedules here. You can even walk on the ice as long as the ice is thick enough. However, always check the latest ice forecast and warnings here before stepping on the ice. The seas around Matinkylä have strong currents flowing past islands, and all this makes the ice less trust-worthy than lake ice without currents. If you go on ice, make sure you are not alone and you have proper gear with you (walking sticks or ice hacks to pull you out of the water if you fall in). The same view from the Rantaraitti path to the sea during summer and winter. During winter, you can walk on the ice if you first make sure it can carry you 100 %. 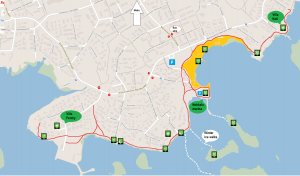 Addresses to use as starting points: Go to either Koukkuniemenkuja 23 or to Nuottakallio 17, Espoo, to reach the furthest points of the Matinkylä area of Rantaraitti (also on the map). By car: There are some car parks in the area but because the promenade is very popular and most parking spots cost money, it is probably best to use public transport. 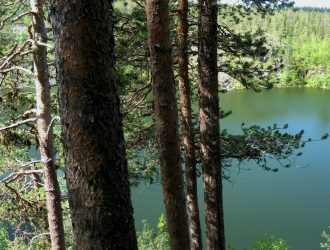 By public transport: Matinkylä has a metro stop that is about 15min walk from the sea shore. You can either walk the distance or take a bus to the shore. Great stops for the bus are Nuottaniemi and Matinlahti. By boat: If you have access to your own boat, there are several public piers you can use to secure your boat. However, there is archipelago route during the summer for boats that connect the nearby islands to the mainland. Haukilahti and Toppelund are areas where you can enjoy lovely seaside views littered with yachts, sporty speedboats as well as smaller fishing vessels while strolling leisurely along the sandy beaches. The area has two marinas and several beaches suited for swimming; there is even a special place to take your dogs for a swim (look for a sign!). If you feel peckish and want a bite to eat or a refreshing cold or hot drink, there are also cafés suited for every taste in this area. You can take a seat on the smooth cliffs that dive into the sea and watch the sun set, exercise on the sand, or explore the forests next to the path and look for berries, mushroom or other treasure. There are some playgrounds for children and a possibility to rent out stand up paddle boards or kayaks. Pretty much something for everyone. 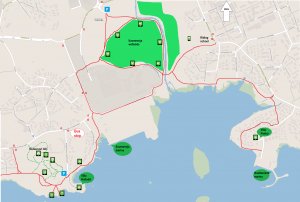 Addresses to use as starting points: Go to either Haukilahdenranta 15 or to Hietaniementie 1-5, Espoo, to reach the furthest points of the Haukilahti area of Rantaraitti (also on the map). By public transport: The best way to get to Haukilahti is by bus from the nearest metro stations either in Matinkylä or Niittykumpu. Great stops for the bus are Hauenkita and Linnake. One of the best things Suomenoja has to offer are large wetlands brimming with birds especially during the non-snowy season. The number of birds in the bay area is ever-increasing, and it is used by bird watchers, students, and hikers alike. There is a path circling the wetland area with frequent bird observation towers in convenient places. Remember not to disturb the birds in any way at any time of the year. A little more to the West, past the wetlands and the water purification plant, lands of old villas that used to own the surrounding lands begin. There are two lovely villas such as Villa Rulludd as well as small sandy beaches and old stone piers next to them for your enjoyment. 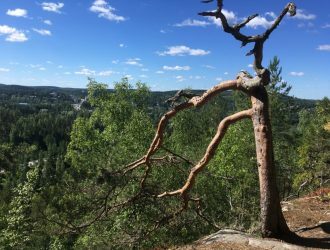 The Rullavuori hill is perfect for a bit of a hike. On its bottom are two several erratic boulders brought to their place by Ice Age movements, and you can walk to the top of the hill using small paths made by previous hikers. 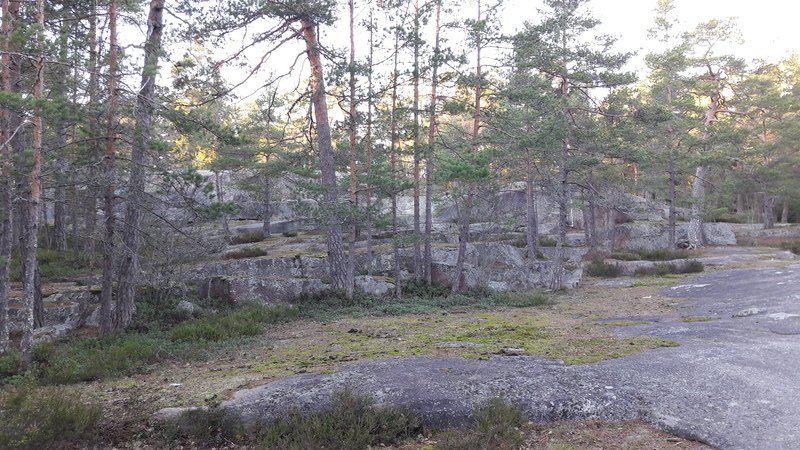 The hill used to belong to the Villa Rulludd estate during the 19th and 20th centuries, and the hill was used as a rock garden for the estate. Even though nature has slowly been taking back its dominion in the area, you can still easily spot remnants of its garden days: there are many domestic plants as well as some more exotic plants that have been planted in the area. Addresses to use as starting points: Go to either Kalastajantie 33 or to Hyljelahdentie 15-17, Espoo, to reach the furthest points of the Suomenoja area of Rantaraitti (also on the map). When to go: You can visit Rantaraitti at any time of the year. The paths are kept clear and sanded even when there is plenty of snow so you are safe to walk there. However, because the paths are just next to the sea, there is sometimes water on the path. During colder periods it’s also possible that this water sets to ice so make sure to keep an eye for very slippery conditions. What to wear: Wear weather-appropriate clothes and remember that it’s always a bit windy next to the sea. Hop on a boat in the summer and enjoy the Finnish archipelago!